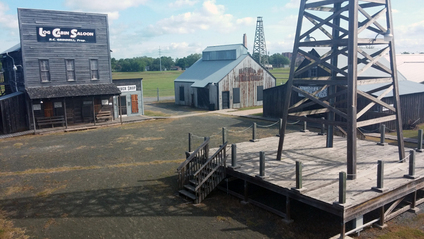 Spindletop-Gladys City Boomtown Museum receives a portion of its operating funds from the State of Texas through Lamar University. However, we must rely on the generosity of our friends and supporters to meet the costs of providing programs, special exhibits and services, year-round, to thousands of visitors. Your membership makes a difference in upgrading our equipment, enhancing exhibits and resources, and hosting events for the community. Building sponsors assist in cleaning and maintenance, provide funds for needed materials, and assist during events. Sponsorships offer businesses an opportunity to generate top-of-mind awareness in the community and, at the same time, support the Museum. From small events like Wildcatter Weekends to our biggest annual event, the Spindletop Drillers Reunion, there is a sponsorship level suitable for any size business. Endowment gifts help Gladys City to plan for the future. An endowment gift is secured in an account while the annual earnings are used. In conjunction with the Lamar University Foundation, an endowment has been established for the museum. With fluctuations in the economy in the past several years, timing is crucial. Donations of supplies and equipment may be dropped off at the Gladys City Gift Shop during regular open hours.